Did Thom Yorke Celebrate The Queen's 90th By Playing His Neighbour's Party? 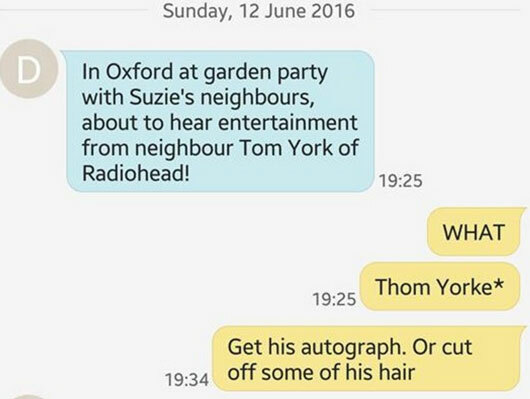 A fan's dad is believed to have texted from a garden party in Oxford this weekend. There were street parties all over Britain this weekend to celebrate the Queen's 90th Birthday, and - according to one Radiohead fan - Thom Yorke performed at one of them. 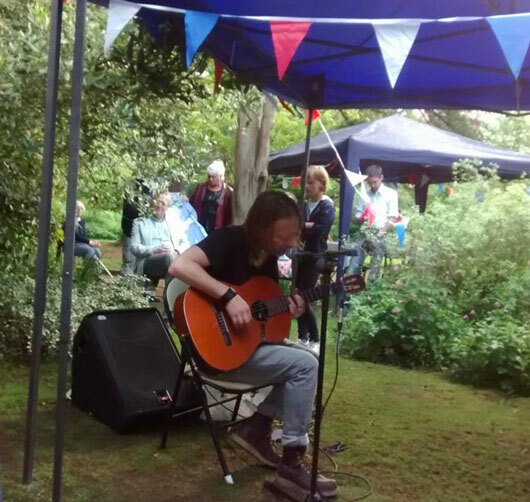 Radiohead superfan and Reddit user, verylittlesound, claims their dad witnessed the Radiohead frontman playing "for half an hour" at a neighbour's garden party on Sunday, and they've got the picture to (sort of) prove it. According to the Redditor, Yorke played a set which included the likes of Desert Island Disk, No Surprises, Street Spirit, Reckoner and I Might Be Wrong- but the diligent dad had to ask around because "they sounded all the same to (him)". After all was said and done, the fan added: "I shall be attending every garden party in Oxford until the end of time, I think"
We think we probably would too.